Chorizo is a spiced, traditionally spicy, pork sausage popular in Latin-American and Spanish cuisines. This chorizo variation uses ground pork and household spices so you can prepare this spicy, smoky sausage without a meat grinder. Allow your homemade chorizo to sit overnight to allow the spices and flavors to blend together, and form into patties or use crumbled into any dish that calls for sausage! Mix with ground turkey makes a great alternative. 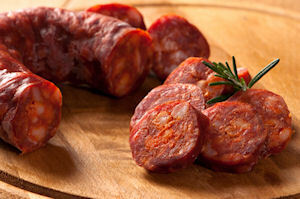 Summary: Chorizo is a spiced, traditionally spicy, pork sausage popular in Latin-American and Spanish cuisines. This chorizo variation uses ground pork and household spices so you can prepare this spicy, smoky sausage without a meat grinder. Allow your homemade chorizo to sit overnight to allow the spices and flavors to blend together, and form into patties or use crumbled into any dish that calls for sausage!